This year, we were on the road exploring during a holiday on two occasions. With an 8-year-old along for the journey, being away from home on a holiday can be a wee bit challenging. While our daughter thoroughly enjoyed our adventures, she also missed her normal holiday festivities. With some planning, we were able to bring some of the holiday magic to her. There are some simple things that you can do to help your child still have some holiday sparkle while on the road! Bring some beloved holiday items with you. If you are traveling during Christmas, how about bringing along your stockings? Gone for Halloween? Bring your child's treat basket and costume along for some trick-or-treating. You can check area malls and museums for safe trick-or-treating options on the road. Play a holiday-themed game. You can easily create some fun for the car ride or hotel room yourself. Devise an inspired Mad Lib, word search or I Spy game. Be sure to bring clipboards and markers in fun colors. Use holiday plates and cups for meals. A plate with cute pink and purple hearts can lighten up Valentine's Day for a child missing their school party! Give a gift. Whether big or small, a little surprise can make the day special. A red, white and blue headband or a flag bandanna can put some spirit into Fourth of July away from the usual round of picnics! Gone on Valentine's Day? Don't forget the heart box of chocolates! Don't forget the tasty treats! Find a portable food option perfect for the holiday. Or, find a restaurant where you can have a holiday-inspired meal. Scout ahead for holiday events at your destination or along the route. With some advance preparation, you can find some holiday events for your child during your trip. On our most recent trip, we were away from home during Halloween. I located a Whole Foods Market as well as a mall that had trick-or-treating for my daughter. We also were able to catch a Halloween parade. A little planning goes a long way! When we were on the road during the Fourth of July and Halloween this year, I was a little worried that my daughter would never forgive us. By peppering our trips with some holiday fun, my daughter barely mentioned missing home! And, we had mounds of fun along the way! Great tips! 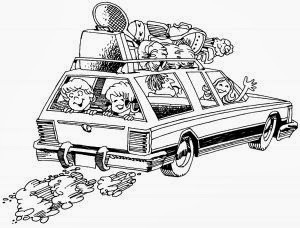 I always like to be home for the holidays but we have family that do not live near us so there will be times when we will have to travel or they will during the holidays. These are good tips to make it a little less stressful. Found your post at Turn It Up Tuesdays.